OMG! He Popped the Question! Now What Do I Do? I got to thinking last night as I reflected on this past weekend’s two weddings where I was privileged to officiate. I’d met with both couples well before the weddings and customized the scripts and vows for them. I also advised them on the processional and talked to them about staying calm on their wedding day because it was all going to be fine. I am an optimist, after all. Both weddings went beautifully. And when I spoke to the brides they were both happy with the ceremonies and happy that it was finally done! They both confessed to being a little overwhelmed with planning and details between engagement and ceremony time. So I put together a little 55-second video with some slides and put it up on YouTube. You can watch it below. As I was editing the video above, I was inspired to create a longer version of the presentation so that I could reassure future brides that as panicked as they might be feeling at the moment, everything would work out just fine, at least as far as the ceremony and the officiant — me! — were concerned. We had that part of the ceremony fully under control. You can see that longer (8-minute) video starring yours truly below as well. I would love to have your comments on these two videos. And a description of your experiences from when he “popped the question” to when your ceremony had been completed. I think other future brides would like to be reassured that what they are feeling is normal! Thanks for reading and watching. And feel free to share this blog post. 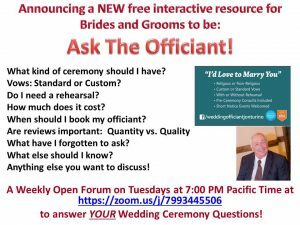 A new live interactive forum to answer your wedding questions. Please note: This service has been discontinued. But I am available one-on-one via phone, email, or live Internet video chat and I’d love to answer your questions. Join us live on Tuesday evenings for this great new resource. 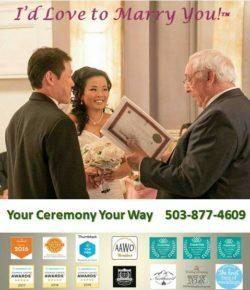 Do you have questions about your ceremony? About your vows? About your venue? About wedding planners and wedding coordinators? You can get answers to these questions during a newly announced series of live interactive video chat session hosted on the Zoom.us platform. The plan is to have people interested in both getting from and providing answers to prospective brides and grooms regarding virtually any topic. Thus I encourage wedding planners, wedding coordinators, wedding venue managers, photographers, musicians and DJs, caterers, cake makers and anyone else who would like to contribute to participate in these sessions. These sessions are not a place to provide sales pitches for products or services. They are meant to provide actionable information to help future brides and groom make their special day as perfect as possible. So if we can help them by identifying and providing solutions to common problems we’ve seen occur during other ceremonies and receptions I think we’ll be adding a lot of value. And my experience tells me that if we provide value then we may be considered when they are making hiring decisions. So please join me on Tuesday evenings at 7:00 PM Pacific time at https://zoom.us/j/7993445506 for the next sessions. If you are a bride or groom to be, we’ll all do our best to provide you with great information that will help you in your planning efforts to make sure that your wedding day is as perfect as possible. If you are a vendor who can provide valuable advice to prospective brides and grooms, your participation is welcome as well. FYI, you may CLICK HERE to watch a recording of the first session that was broadcast on October 25, 2016. You missed this event but you can see what I’m trying to accomplish by watching the recording. As always, your comments and thoughts are more than welcome. Thanks for reading and I hope to “see” you at an upcoming session.